Wipf & Stock, Eugene, Oregon, 2009. 220 pages. I’ve written about other books that have convinced me of the viewpoint of Evangelical Universalism, that hell, though real, does not last forever and ever. This book had some ideas in it that are new to me and answered some of my last points of doubt. It is the book I will now recommend to evangelicals who have studied theology and are concerned about believing what the Bible teaches. It’s interesting to me that Bradley Jersak was especially strong in explaining a Universalist view of Revelation – yet he is not dogmatic about his views at all. He sounds more like I did when my eyes were first opened to the possibility that this might be true, that this might really be what the Bible is teaching. God is not angry with you and never has been. He loves you with an everlasting love. Salvation is not a question of “turn or burn.” We’re burning already, but we don’t have to be! Redemption! The life and death of Christ showed us how far God would go to extend forgiveness and invitation. His resurrection marked the death of death and the evacuation of Hades. My hope is in Christ, who rightfully earned his judgment seat and whose verdict is restorative justice, that is to say, mercy. Hope. That is my bias, and I believe that Scripture, tradition, and experience confirm it. I want to explain and validate my hope in those contexts. This book will address the central problem of this “heated” debate: not infernalism versus annihilationism versus universalism, but rather, authentic, biblical Christian hope vis-à-vis the error of dogmatic presumption (of any view). Hope presumes nothing but is rooted in a deeper confidence: the love and mercy of an openhearted and relentlessly kind God. In short, I do not intend to convince readers of a particular theology of divine judgment. I hope, rather, to recall those relevant bits of Scripture, history, and tradition that ought to inform whatever view we take on this important topic. I have devoted an entire chapter to the Gehenna tradition, because it is not just another term for hell: it represents a pivotal point in our understanding of divine judgment. Our understanding – or misunderstanding – of the Gehenna tradition(s) shapes our view of hell and judgment. More than that, it profoundly influences our understanding of Jesus’ ministry and message. I don’t presume to have it all figured out, but so much essential data has been overlooked (esp. Jesus’ use of the Jeremiah tradition) that it behooves me to share some of the results of my spadework. Unfortunately, Christian tradition, theology, and translation followed the apocryphal reading of Gehenna rather than the biblical tradition of Jeremiah and Jesus. The Church zigged with Enoch, Esdras et al when Jesus zagged with Jeremiah, so to speak…. While the legacy of Gehenna stands as a genuine warning of destruction to those who persist in rebellion and idolatry, Jeremiah and Jesus forewarn us to avoid the consequential wrath. For those who experience the calamities of the “way of death,” the invitation is extended to a New Covenant of restoration. Sin and its consequences are overcome by redemption and restoration. Rather than terrorizing the world with eternal, conscious torment in a literal lake of fire, the Church can hold out the New Covenant of Jesus in which even the Valley of Slaughter is sanctified, every curse of destruction is broken, and God’s exiles find their way home. We ought to also note the irony and incongruence of the Church utilizing the very place where God became violently offended by the literal burning of children as our primary metaphor for a final and eternal burning of God’s wayward people in literal flames. Thus, God becomes the very Molech who decrees that the angels must deliver his children to the flames, even though this was the very reason he ordered Hinnom to be desecrated in the first place! He goes on to look at judgment as seen throughout the Bible, the lake of fire, and the rich man and Lazarus, as well as the views of theologians since the beginning of the church. God deals with sin through correction, not punishment. That’s Clement, that’s Hebrews, that’s Hosea. The chastisements of God are disciplinary: not because divine justice demands satisfaction (Anselm, Cur Deus Homo), payback, or wrath (Calvin, penal satisfaction! ), but because God is raising beloved children who tend to learn the hard way. The hardest lesson we learn is the lesson of the Cross: the horrible revelation that it was each of us who crucified perfect Love (Zech 12:10), yet in love God forgave us (1 John 4:9-10). This is more than learning by moral influence. The Cross is a revelation of God’s love, our violence, and Jesus’ power to forgive and redeem – all at once. Don’t miss this point, because it marks a major fork in the theological trail. For centuries, I fear that we veered when Clement actually had it right. This section also looks at various traditions in the church, how the infernalist view came to be widespread, and various different views today. 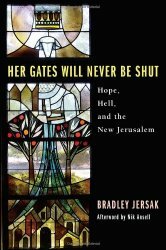 The last section, “Her Gates Will Never Be Shut,” has a subtitle of “Hints of Ultimate Redemption in Revelation 21-22.” I had always thought those chapters were some of the hardest to reconcile with universalism, but Brad Jersak sees them as a crucial part in his hope of redemption for all. Especially interesting is how he ties the words of Revelation about the water of life flowing from the throne with the Gehenna tradition he’d already explored. It would be tempting to excerpt this verse from its context to make it read that we are blessed if we have washed our robes in the Gospel blood of Christ in this life so that we can be welcomed into the gates of the New Jerusalem in the next. In fact, to avoid any posthumous possibility of salvation, one must read it that way. But if we remain ardently biblical (now is not the time to waffle), the text says far more than that. First, those who say yes to the Gospel in this life are already part of the Bride, adorned in righteous robes, coming down as the New Jerusalem and issuing the invitation to others to enter. I.e., those who are washed are already “in.” The universal invitation is for those outside the city and needing to enter after the establishment of the new creation. Lest the invitation be misunderstood as an anything goes pluralistic universalism, there is a hard pause. Anyone can come, but only if they have their robes washed in the blood of the Lamb. Only upon a specifically Christian redemption can one enter the gates and eat from the tree of life that grows in the city (another picture of Jesus). This vision declares the possibility and the hope that even in the next age, there are those whose thirst will finally bring them to say yes to the Lamb, even those who were unable to do so on this side of the grave. Brad Jersak has an Addendum at the end, “A Word to Fellow Evangelicals.” So much of it mirrors what I’d like to say to my fellow evangelicals as well, so I’m going to include some bits from that in conclusion. We need to become even more biblical than that, allowing Scripture to trump our inherited ideologies even when we’ve invested so much of our hearts in those systems. Dare we let Scripture say what it says without reinterpreting what it “really means” into the margins of our Study Bibles? Second, if we listen honestly, we will discern between pluralists who see every path leading to heavenly bliss without judgment and without Jesus vis-à-vis the ultimate redemptionists, who continue to say “no one comes to the Father except through Jesus” and “no one enters the kingdom without having his or her robe washed in the Lamb’s blood.” Yet the latter group proclaims with Revelation 21-22 that heaven’s door never shuts, and the Spirit and Bride continue to say, “come.” They hope that all may still ultimately respond to the Gospel with a “Yes!” They do not believe in a second-chance theology; it is a seventy-times-seven-and-beyond hope. The question is, is there a place among evangelicals for them? I find myself more freely evangelistic now than at any other time in my life, and yet without any pressure or fear. It is wonderful…. I conclude with this exhortation to examine our hearts on this question: What in us needs the traditional infernalist version of hell? What purpose does it fulfill? Is it our carnal sense of justice as payback or an even darker Schadenfreude? If anything needs purging, it is that. In exchange, I believe God has called us to surrender our self-assurance for a much broader and deeper hope. Brad Jersak is not presumptuous. He is not dogmatic. But he brings up some valid questions for Christians, and I think points out some wonderful, blessed reasons to increase our hope.